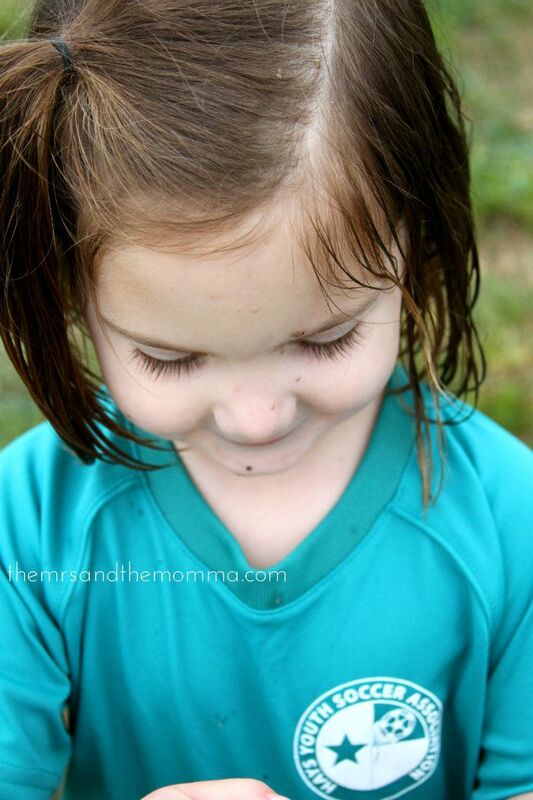 You know, the soccer season where my two oldest girls cried the entire time? 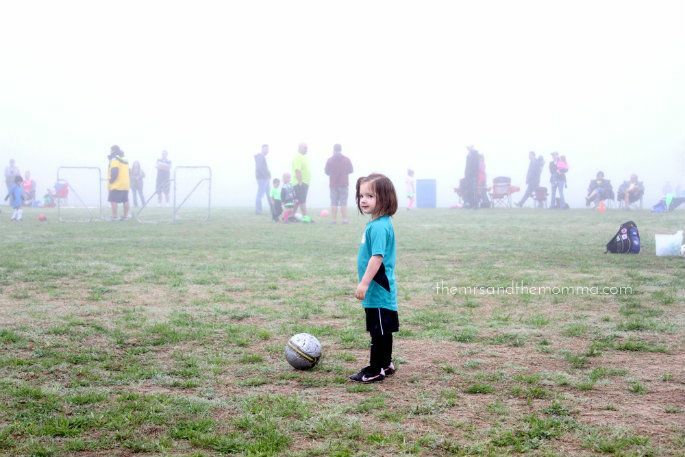 Well, this year Blakely had said she wanted to play. Blake and I thought...sure, why not...she's different from her sisters, maybe this won't be a repeat of last time. 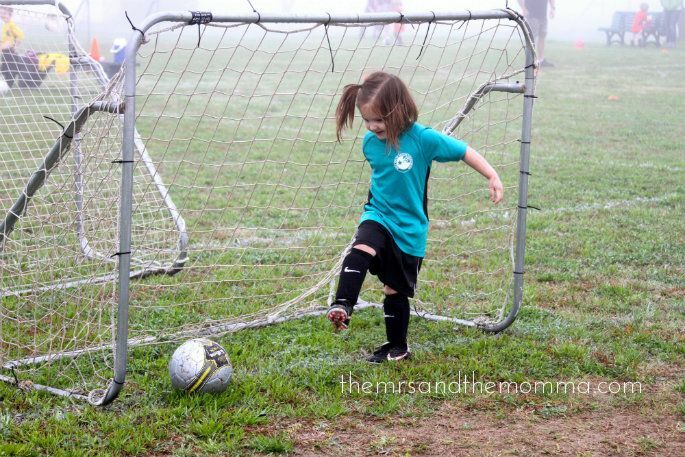 And heck, we already have the shin guards and cleats, so we're golden, right? 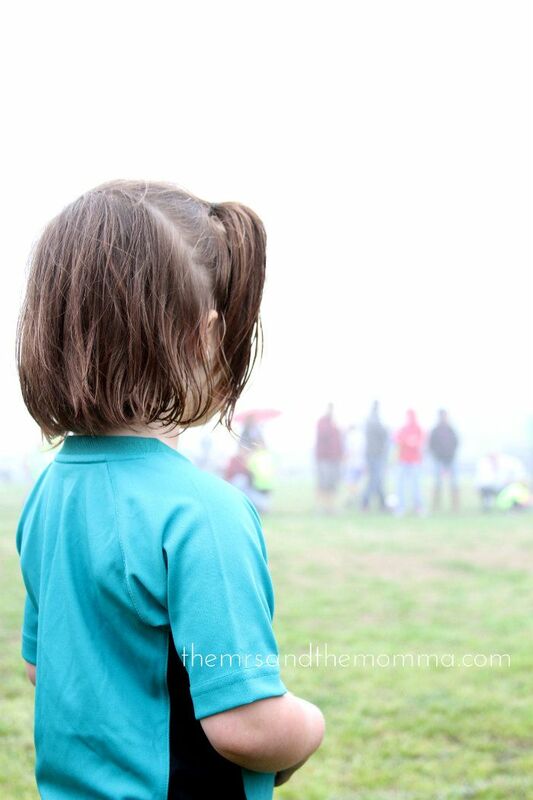 Well, her first game was this past Saturday and it was a messy, nasty day, with heavy fog and mist. 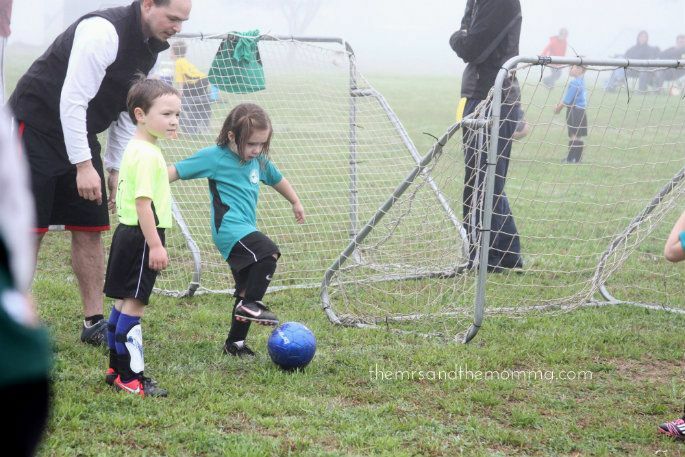 Daddy is her coach and each game has 30 minutes of practice beforehand. I was armed with both my camera and iphone to capture our third daughter's sporting debut, grandparents were present, full water bottles... We were ready. And then some one....some one...told her right before the game started, that the game of soccer actually consists of playing against other kids who are trying to steal the ball away and score at their own goal. 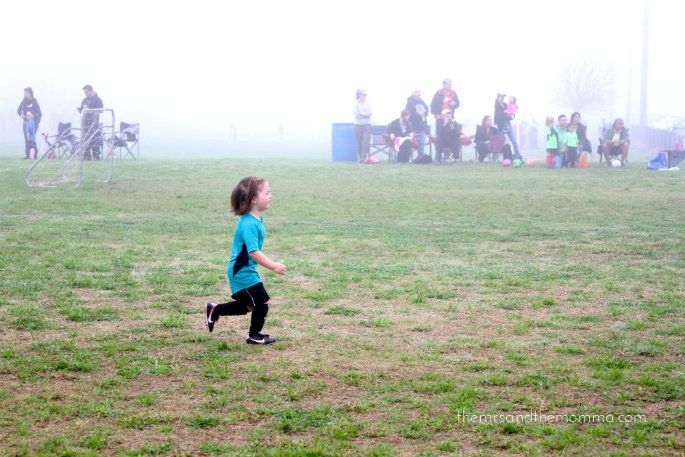 And when the game began, that she would have to run, keep the ball away from the other team, and score....but of course, have fun while doing it. Pretty standard, right? 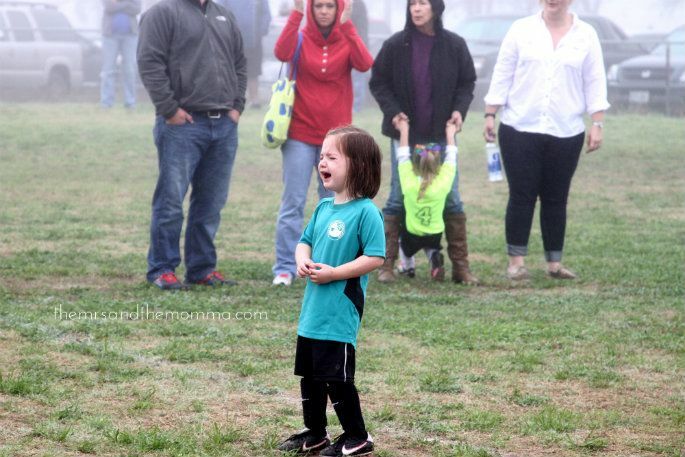 I mean, we figured we should give her a heads up about what was about to go down, as I'm pretty sure she had never actually witnessed a soccer game. I now realize we should have had that conversation before we signed her up. This is about where it all came undone. And this is about where I had a detailed, visceral flashback to 3 years ago when we went through this EXACT. SAME. THING. I was so incredulous that all I could do was laugh at the situation. Really???? Really!!! It's just soccer!!!!! Are we really doing this again?!? I was so sure this time would be different. 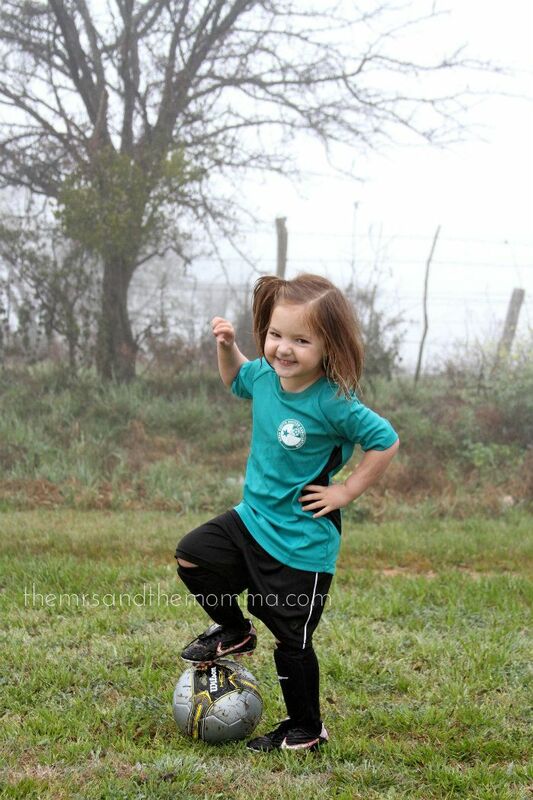 Blakely is our feisty one...Miss "I Don't Care". She was SO pumped about this. What on Earth made her balk at the thought of a (gasp) competition is beyond me. 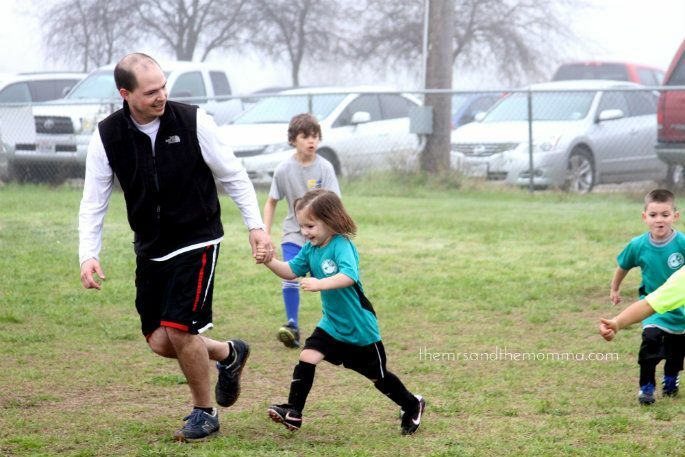 After most of the game went on like this, Coach Daddy finally decided to help her along (read: make her play) by holding her hand and running along. This is seemed to work...almost magically. I thought, wait...is she totally playing us??? 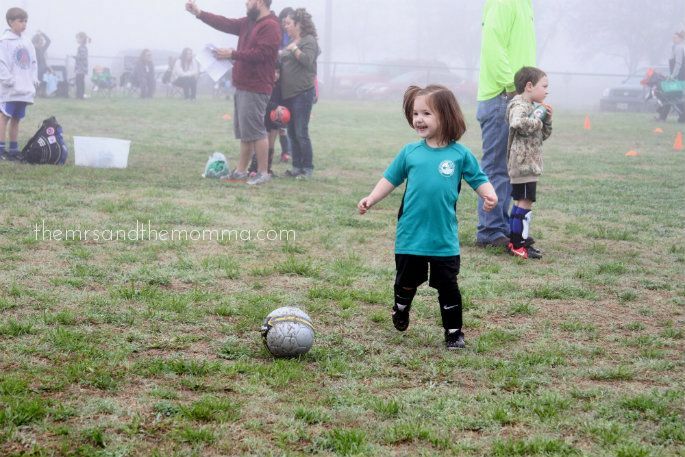 I'll just make a big fuss and act like my sisters did when they played soccer and surely Daddy will end up letting me hold his hand the entire rest of the game and be my security blanket FOREVER!!!! Muahahahaha. I've got 'em right where I want 'em. 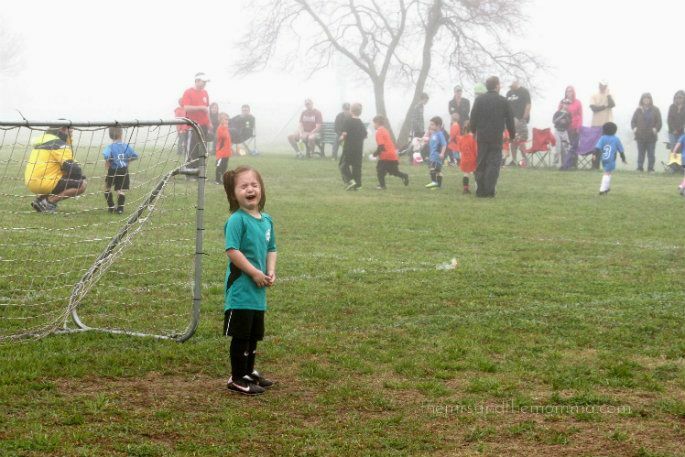 And after the game, when we asked her what she thought of it... She said she had lots of fun. Oh boy! Sounds like your soccer season is going to be super fun. Hahaha you are in for a ride with that one ;) she is SO cute!! Oh you are quite the commentator and you nailed it right on! 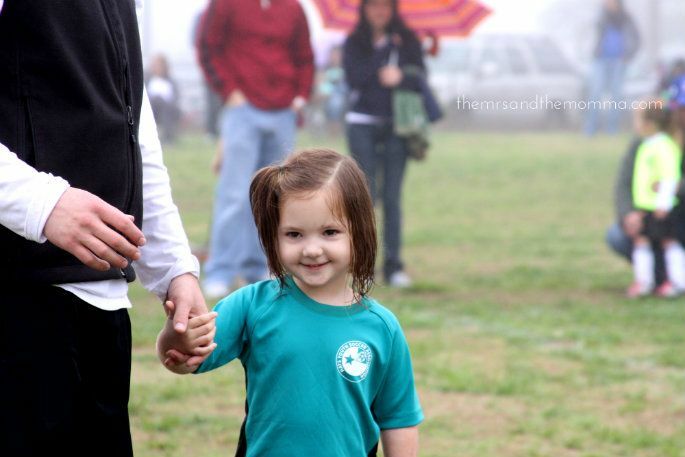 She is incredibly adorable and YES she knows exactly what she's doing! I remember at one point when she let go of Blake's hand and was running, laughing and stopped in her track..."oh wait, I'm supposed to be crying"! Haha. I LOVE IT!!! !